Viper Central have been known as a first-rate Bluegrass band since their debut album The Devil sure is hard to please appeared in 2008, but this latest release – Viper Central’s third album – sees them heading off in some new directions. The Canadian quintet have taken the bold step to incorporate a more modern folk band feel onto several new tunes, as well as some western swing (the Mariachi trumpet infected Losing My Mind) and country-folk, it certainly makes for an eclectic mix and something quite different from their previous offerings. They’ve done this by making The spirit of God & Madness a split album – if this were a vinyl release then Side 1 would be the new direction material, whilst Side 2 offered up the very solid Bluegrass experience that one associates with Viper Central with a mixture of traditional and new songs and a cover of Gram Parsons’ Luxury Liner. So what we might term the new style songs, by Kathleen Nisbet, take in a wide gamut of styles and topics. Prophet of the New World features a shamanistic drum beat and some rolling electric guitar to tell the tale of Louis Riel – incidentally one of Nisbet’s ancestors. 99 Cents Short is almost Hank Williams country, with his light touch and ironically twisting lyrics. The ‘ornery and mean outlaw song Ned Kelly is a a banjo and harmonica driven blues whilst Cherry Red drifts right into full Americana territory with an oozing electric organ and guitar combining with Nisbet’s vocals to evoke the man driving away “from too much love”. Mentally flipping over to the second side there’s straight off an excellent opener in the gently swaying I won’t be left behind, documenting the 19th century journey of Katherine O’Hare from Ireland to the new lands of the Americas – crossing The Rockies at the age of sixteen. There’s a tremendous bluegrass trio of tracks in the fiddle led Devil’s Reel, the song Devil’s String and the instrumental Bloddvein Breakdown – these are taken at full tempo and instantly act as a reminder of what a great Bluegrass band Viper Central is. The Mission slows things down somewhat to a wistful and gentle love song. Bear Claw is an evocative, if short, steel guitar instrumental which crisply twangs and steely flows – like water over rocks or misty spray from a waterfall rolling over banks. 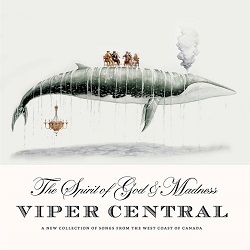 The Spirit of God & Madness does feel like an album with a split personality – but as a way for Viper Central to introduce a widening of their musical pathways it makes a lot of sense and, having already effectively nailed Bluegrass, it clearly filled a need in the band to develop a broader repertoire. And it works. On their third album Canadian band Viper Central turn some new corners and add a few twists to their Bluegrass menu.